Caption slip reads: "Photographer: Gaze. Date: 1954-05-05. Reporter: Gaze. Assignment: Lisette Fisher divorce. 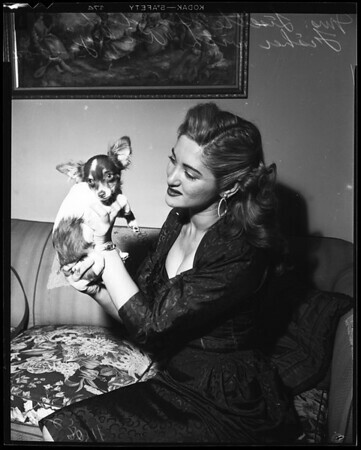 5/6/7/8/17: All except one neg show Mrs. Lisette Sanditch Fisher with her pet long hair Mexican chihuahua 'Rickey.' Husband is seeking return of dog in divorce action. 'He's my baby, I won't give him up,' says Lisette".